Florida Georgia Line holds the records for the most cumulative weeks atop the Hot Country Songs chart (106) and the most weeks atop the chart for a single song (50 for "Meant to Be," a collaboration with pop singer Bebe Rexha). This 50-position chart lists the most popular country music songs, calculated weekly by collecting airplay data from Nielsen BDS along with digital sales and streaming. The current number-one song, as of the chart dated April 27, 2019, is "Beautiful Crazy" by Luke Combs. "Beautiful Crazy" is a song by American country music singer Luke Combs. The song, which he wrote with Wyatt Durrette and Robert Williford, is a bonus track to his 2017 debut album This One's for You. The song had gained viral attention prior to its release as a single. The "best sellers" chart – started May 15, 1948 as "Best Selling Retail Folk Records". A "jockeys" chart – started December 10, 1949 as "Country & Western Records Most Played By Folk Disk Jockeys". On January 20, 1990, the Hot Country Singles chart was put to 75 positions and began to be compiled entirely from information provided by Nielsen Broadcast Data Systems, a system which electronically monitors radio airplay of songs. Four weeks later, on February 17, the chart was retitled "Hot Country Singles & Tracks". Beginning with the January 13, 2001 issue, the chart was cut from 75 to 60 positions, and all songs on the chart at the time had their tally of weeks spent on the chart adjusted to count only weeks spent at No. 60 or higher. Effective April 30, 2005, the chart was renamed "Hot Country Songs". These are the songs with 16 or more weeks at number one. Fifteen songs accomplished this feat between 1946 and 1964, but none did so again until after the 2012 reformulation; between "Almost Persuaded's" nine-week run in 1966 and the chart's reformulation in 2012, no song spent more than eight weeks atop the chart. Prolonged runs became commonplace again in 2012 As of October 2018 [update] ; five songs from this period have topped the chart for at least 16 weeks, and the top three longest chart runs have all been since 2012. Note: Songs marked achieved their runs on the Most Played in Juke Boxes chart (published 1944-58). Songs marked achieved their runs on the Best Sellers on Stores chart (published 1948-58). Songs marked achieved their runs on the Most Played by Jockeys chart (published 1949-58). All songs listed for the period when multiple charts were in operation also had shorter runs at number one on the other charts not indicated. The three charts were merged to create Hot C&W Sides (now Hot Country Songs) in 1958. "Right Where I Need to Be" is a song written by Casey Beathard and Kendell Marvel and recorded by American country music artist Gary Allan. It was released in September 2000 as the third and last single from Allan's 1999 album Smoke Rings in the Dark. The song reached number 5 on the U.S. Billboard Hot Country Tracks and Singles chart in June 2001, thus becoming his first Top 5 hit and his third Top 10. "I'll Hold You in My Heart " is a 1947 song by Eddy Arnold. The song was Eddy Arnold's third number one on the Billboard Juke Box Folk Records chart. "I'll Hold You in My Heart " spent 46 weeks on the chart and 21 weeks at number one. The song also served as Arnold's first crossover hit, peaking at number 22 on the Billboard Best Sellers in Stores chart. 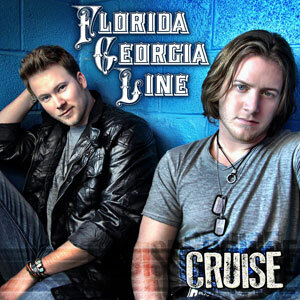 "Cruise" is a song recorded by American country music duo Florida Georgia Line. It was first released to iTunes in April 2012 and then to radio in August 2012 as the first single from their extended play It'z Just What We Do. It was written by group members Brian Kelley and Tyler Hubbard with Joey Moi, Chase Rice, and Jesse Rice. It is included on their first album for Republic Nashville, Here's to the Good Times, which was released on December 4. "Cruise" is the best-selling country digital song of all time in the United States as of January 2014. The song is considered the foremost example of the genre of country music termed "bro-country". 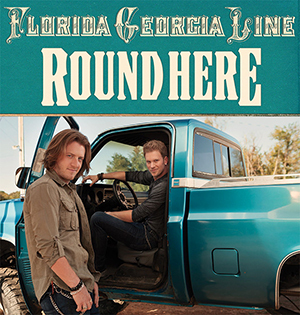 "Round Here" is a song recorded by American country music duo Florida Georgia Line. It was released in June 2013 as the third single from their album Here's to the Good Times. It was written by Rodney Clawson, Chris Tompkins, and Thomas Rhett. 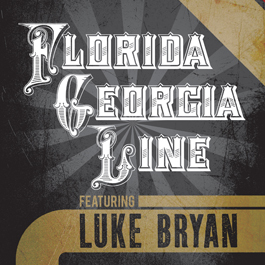 "This Is How We Roll" is a song recorded by American country music duo Florida Georgia Line with fellow country music singer Luke Bryan. It is the fifth and final single from Florida Georgia Line's debut studio album, Here's to the Good Times, although it is only included on the 2013 This Is How We Roll re-release. Cole Swindell assisted the artists in writing the song. A remix, featuring Jason Derulo and Bryan was released on June 6, 2014. 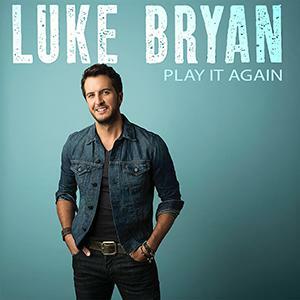 "Play It Again" is a song written by Dallas Davidson and Ashley Gorley and recorded by American country music artist Luke Bryan. It was released in March 2014 as the fourth single from Bryan’s 2013 album Crash My Party. On April 17, 2014, the song became Bryan's eighth non-consecutive chart-topper on the Hot Country Songs chart, the most by any act in the time since his first number one "Rain Is a Good Thing" hit the top spot on July 24, 2010. 1 2 3 "Billboard Country Update: November 12, 2018" (PDF). Billboard. November 12, 2018. Retrieved November 13, 2018. 1 2 3 Campbell, Michael (1 January 2012). Popular Music in America:The Beat Goes On. Chapter 30 Honky Tonk: Cengage Learning. p. 125. ↑ Whitburn, Joel (2005). Joel Whitburn's Top Country Songs: 1944–2005. Record Research. p. ix. ISBN 9780898201659. ↑ "R&B Enjoying Rare Dominance Over Rap". Billboard: 68. 24 April 2004. Retrieved 25 April 2018. ↑ Jessen, Wade (January 13, 2001). "Country Corner" (PDF). Billboard. ↑ "Country returns to audience-based chart". 20 November 2004: 88. ↑ Jessen, Wade (6 December 2012). "Taylor Swift Makes Country Songs History". Billboard Magazine. Billboard Musix. Retrieved 5 April 2018. ↑ Jessen, Wade (August 1, 2013). "Florida Georgia Line's 'Cruise' Sets Record For Longest No. 1 Run On Hot Country Songs". Billboard . Retrieved August 18, 2013. ↑ Elias Leight (March 26, 2019). "Lil Nas X's 'Old Town Road' Was a Country Hit. Then Country Changed Its Mind". Rolling Stone . Retrieved March 27, 2019. 1 2 3 4 Asker, Jim (April 3, 2018). "Florida Georgia Line Now Has 3 of the 5 Longest-Leading Hot Country Songs No. 1s, Thanks to 'Meant to Be'". Billboard. Retrieved April 5, 2018. 1 2 3 4 5 6 7 8 9 10 11 12 Jessen, Wade (July 24, 2013). "Florida Georgia Line's 'Cruise' Ties For Longest No. 1 Run On Hot Country Songs". Billboard. Retrieved April 25, 2018. ↑ Whitburn, Joel (1996). The Billboard Book of Top 40 Country Hits. Watson-Guptill. p. 515. ISBN 0823076326. ↑ Whitburn, Joel (1996). The Billboard Book of Top 40 Country Hits. Watson-Guptill. p. 516. ISBN 0823076326. ↑ "Florida Georgia Line Marks One Hundred Total Weeks Atop Hot Country Songs With 'Meant To Be'". Billboard. October 2, 2018. Retrieved October 4, 2018. ↑ "Bebe Rexha & Florida Georgia Line's 'Meant to Be' Breaks New Record". Billboard. July 22, 2018. Retrieved July 24, 2018.